Northborough – paid his annual visit to the Board of Selectmen at their Jan. 28 meeting to discuss findings from the FY2018 Audit Report. Overall results revealed that Northborough is a fiscally sound entity with a low debt ratio. “The town has worked hard over the past several years to maintain a strong financial position…It has approximately $8.3 million in its unassigned fund balance. Despite these reserves, the budget process for the next few years will continue to be challenging,” Fraher stated in a report he filed with the town. He said that in using auditing standards relevant to control deficiencies, there were neither material weaknesses nor significant deficiencies in FY2018 which was great news. The town also has been diligent in compliance with grant requirements. Fraher then reviewed the town’s funding of OPEB (post-employment benefits.) Northborough has been funding OPEB since 2015. With a liability of $42,578,794 as of June 30, the town had built a trust fund with a balance of $2,438,950 as of the same date. The recommendation is that the town should continue its funding. The budget presented at the Annual Town Meeting last April was within 2 percent of the actual amount expended which, according to Fraher, is the “sweet spot.” If the percent gets too low, then the budget is so tight that a bad year would pose problems for meeting expenses. “One of the really smart things that the board approved many years ago was to really try to keep the Free Cash number that is being allocated to the operating budget at a fixed level,” Fraher noted. He also said that when bond rating agencies look at towns, they look at cash reserves and stabilization funds. Northborough is in a good place. Since 2015 Northborough have been consistently appropriated at least $200,000 annually to stabilization. Bond rating agencies also look at what towns’ plans are relative to and what they are contributing to their pension and OPEB funds, realizing that it is going to take a long time to fund their liabilities. 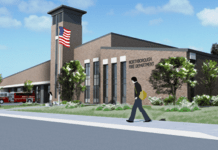 Northborough has exhibited a commitment to the growth of this line item. A challenge is that the liability is a moving target. “It is nice that it’s sort of a status quo situation in terms of how our community is run and how the finances are approached,” remarked Selectman Leslie Rutan. “We talk about what we can afford, your job and the financial planning committee’s job and the appropriations committee’s job and my job is to make sure that as a corporate entity, we are clear about what we can afford,” stated Town Administrator John Coderre.